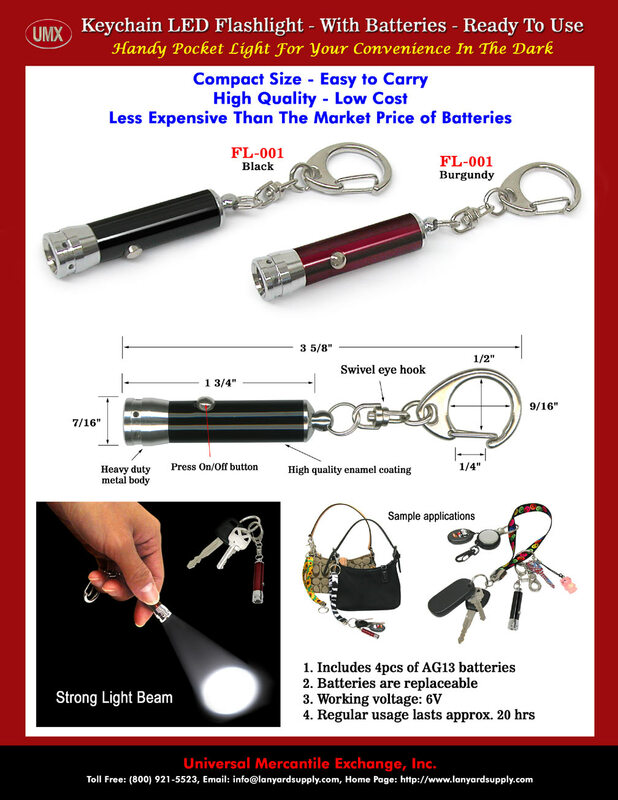 Compact Size Keychain Flashlights: A Great Add-on Flashlight For Keychains - Easy to Carry. The high quality and compact size LED keychain flashlight are very handy and easy to carry. They come with heavy duty metal body, press on/off button, high quality enamel coating, swivel eye keychain hooks, and include 4 pieces of replaceable AG13 batteries. The strong LED light beam can help in a variety of applications. They are great add-on for your car keys, purses, retractable reels, lanyards and more. You are viewing Lanyards > Badge Reels > Keychain Flashlights - Compact Size - Great Add-on For Keychains.